Beans of all varieties are fairly easy to grow but, as with all plants, they do have their fair share of diseases and pests that can decimate a crop. A major marauder is the beetle, and may I say that these looters come in not just one variety but several different types. How to keep beetles from green beans and other legumes may not be the burning question of our time, but if you are a gardener that’s put his or her heart and soul into the bean patch, you want answers. Help, There are Beetles on My Green Bean Plants! First of all, don’t panic. You aren’t the first and you won’t be the last to find beetles on your green bean plants. 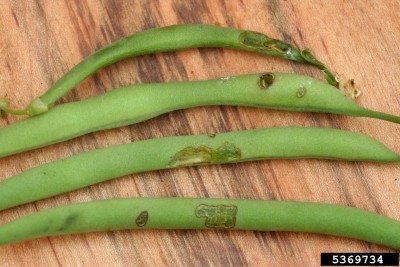 If you try to identify the beetle, the better able you will be at finding a method of green bean beetle control. Japanese beetle – One ravager may be the Japanese beetle. 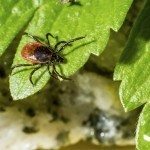 These pests were inadvertently brought over from Japan and rapidly spread through most of the Eastern United States. They are easy to identify with metallic green abdomens and bronzed wings. If you live in the Western or Southern portion of the United States, the Japanese beetle hasn’t established there, so your beetle is likely a of a different ilk. 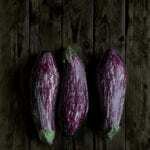 Mexican bean beetle – Another beetle pest might be the Mexican bean beetle. Both adults and larvae munch on the undersides of the leaves, young pods and stems, leaving a ghostly, lace like apparition of a leaf behind. The adults are about ¼ inch long and look like big, yellow ladybugs with 16 black dots across their backs. The larvae are 1/3 inch long grubs with six longitudinally arranged spines along their orange to yellow backs. 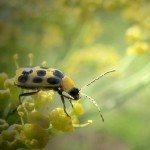 Cucumber beetle – Another beetle bane might be the spotted cucumber beetle. They also look like ladybugs but are yellowish-green with 12 black dots. You will find these beetles eating green bean leaves as well as on occasion melons, squash, cucumbers, eggplant, peas and some greens, again leaving behind a skeletonized version of foliage. All of these beetles are also known to feast on the growing bean pods too, leaving unsightly holes throughout the fruits. Upon first viewing the beetle adversaries, the first instinct is to eradicate them immediately, but how do you go about controlling green bean beetles? Okay, I know some of you are thinking “insecticide” and while it is true that this is the most direct route, it’s too easy! Try getting your hands dirty first and save the insecticide as a last resort. Organic beetle control at its most basic is hand picking. This is the first line of defense if you aren’t squeamish and the numbers are not too daunting. Try hand picking in the early morning when the insects are sluggish. Pluck them from the plant and dump them into a bucket of soapy water. They may be so lethargic that when you try to pluck them, they fall from the plant onto the ground or lower limbs below. Try putting a light colored material beneath the plant to spot the deserters and dispose of them more easily. Another organic beetle control may be to use traps. These can be found at the local garden center. Neither of these methods will completely control the population. You are just getting the adults. It may take biological tactics to win the war. For instance, in the case of the Japanese beetle, the larvae begin to hatch in the midsummer. This is the best time to use your arsenal of biological controls to eradicate the pests. Parasites, nematodes and fungi are all available methods for controlling the Japanese beetle. Give the insect eating beneficial nematode a go. You can also try Bacillus thuringiensis, an insect toxin that poisons the beetle’s stomach or the bacteria Bacillus papillae, which infects the grubs with Milky Spore disease and leaches into the soil to prevent future generations. All of these are rapacious predators of both the egg and young larval stage of many beetles. Also, apply diatomaceous earth around the plants. 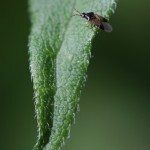 Try spot treating with insecticidal soap and neem oil combinations. Be sure to thoroughly cover both the upper and lower leaves completely. Treatments should be repeated every seven to 10 days if additional beetles are found. Consider planting early maturing bean varieties to thwart Mexican beetles, which are at their peak during summer. Plant a trap crop of zinnias or marigolds away from the veggie garden to lure the beetles to tastier fare. Also, interplant garlic or chives among the beans. The strong odor will often deter the beetles. Keep the area around the bean plants free of detritus and remove any damaged or diseased foliage. 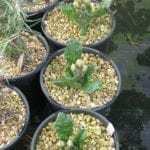 Lastly, try using paper cups to protect seedlings or add fine screening or row covers over the crops, secured at the sides to prevent adult beetles from flying in. Remember, all of these organic control methods take longer than controlling with insecticides and you may need to battle with multiple methods, but the results are infinitely longer lasting and healthier for you and the environment.